A new to me Capcom Breakshot is stuck in attract mode. Opening the coin door will NOT put the pin into diagnostic / test mode. It fully boots, all playfield lights work, the DMD works, and displays attract screens. None of the buttons do anything and opening the coin door does not put it into attract mode. It says 0 credits, but the game has not coin mech, so I can't easily try to add credits. -Opening the coin door does NOT put the game into diagnostic mode. I have pulled the CPU J9 connector off of the CPU (the connection for the coin door open switch goes) and I have shorted the J9-10 pin to the J9-9 pin, which when I read the manual this is circuit it shows for the coin door being open, but nothing happens. -Additionally, and oddly, when I pull the CPU J9 connector off, and test the voltage on the J9-9 pin is 4.72 volts, HOWEVER, when I jumper the J9-9 pin to the J9-10 pin the voltage drops to 0.00 on both pins. It is like the power to the J9-9 pin is being shut off when a connection is made the J9-10 pin. -I have tested the connection of the CPU J9 pins and they do have continuity from the pin to the traces on the board (I had hoped it was something simple like the connector was pulled hard and the solder joints were cracked, that does not appear to be the case). -The pin will not load the balls from the outhole/drain into the ball trough, all three balls just sit piled up in the outhole area. Bump for an awful weather day coming up tomorrow when I will likely be stuck at home and have time to try and fix this pin. OK so do you have the coil interlock buttons on the left side of your coin door? Top one should put the game in test mode, and you might have to push/pull the second on in to get coil activity? Trying to remember how it works in relation to W/B..I know once I out mine in the Menu system I can't get it out of it. Yes, those test buttons are just inside the coin door. The button does not trigger test/diagnostic mode. 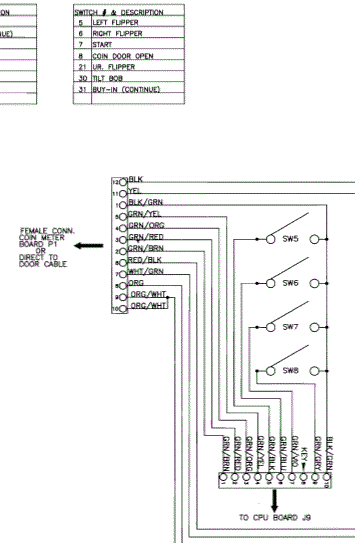 I have gone straight to the CPU where the wiring diagram indicates the this circuit runs. The "coin door open" switch appears to be J9 connector Pin 9 to Pin 10 circuit, which I have completed via jumpers onto these two pins. I have also tested the connection with these pins to the first component on the CPU, they are good. So I don't think the solder joints on the pins are bad either. I am fairly certain the problem is within the CPU board itself. What makes this maddening is that the game appears ready to play, it is in attract mode, the lights are putting on a nice show, the DMD is displaying messages, but I can't get the pin to do anything. Are those switches part of the overall switch matrix or are they dedicated ones? Do they have associated diodes mounted on the CPU board? Have you tested the switch to make sure it's opening or closing when you open / close the door? LEDs in Capcom games w/o the OCD board should be illegal. I believe the these particular switches are dedicated to the CPU board. I believe I have the correct portion of the schematic in my first post that shows this connection. Please note the J9-10 pin is just a ground. Yes, the switches have diodes on the CPU board. They test correctly and show continuity. I have even jumpered further upstream on the J9-9 pin in an attempt to bypass possibly bad traces and still no result. I am guessing I have an issue with the CPU on the level of a bad chip or component. I was hopeful the description of the problem, i.e. the game would not enter diagnostic mode when the coin door was open, but it still would go into attract mode would trigger a memory for someone. Once again, very frustrating, it looks like the game should be working great, full attract mode on the DMD screen and playfield lights, the two diagnostic LEDs show one solid and one blinking from full bright to dim several times a second, just like they are supposed to be for a correctly functioning game. Can you jumper the coin-in switches to try to add credits and start a game. Do you see any voltage at all on the pins of J9 that the cabinet switches go to? You may have a bad LM339 on the CPU board I guess?? Do you see any voltage at all on the pins of J9 that the cabinet switches go to? when I pull the CPU J9 connector off, and test the voltage on the J9-9 pin is 4.72 volts, HOWEVER, when I jumper the J9-9 pin to the J9-10 pin the voltage drops to 0.00 on both pins. Pinwiki references a memory protect switch but it's not clear to me if this is a physical switch or a software implementation of some sort. "Adjustments, audits and diagnostics are done using the flipper and start buttons and the menu is entered upon opening the coin door (memory protect switch activated)." I have tried to jumper the correct wires on the coin mech plug, I don't get any response. All of the CPU J9 pins have 4.72 volts (except J9-10, which is the ground, and yes, it does show continuity to the ground). I am pretty much at the edge of my electrical understanding. I can run a continuity test, I can test a diode and resistor, I can follow a wiring diagram, but I don't really know what the various parts on a circuit board are doing. So I don't know how to test the various chip type components on a board. It would be great if you could get it started up to see if more of the cabinet switches have a problem but since you are seeing ~5VDC on the pins, and presumably then the switch it sounds like the wiring is okay. If you look at the schematic pin 11 of U11 should get pulled low when the switch is closed (I'm assuming the door switch is a normally closed switch which goes open when you close the door but I don't know that for sure) and the comparator should then pull pin 13 of U11 low. You should be able to test these points with a meter when opening and closing the door. U3 pin B1 looks like it's feeding the LM339 for that switch. Page 63 in the manual says U3 is a 74LS245. Getting any activity on B1 (pin 18) of U3? grumpy or quench or barakandl could probably give you ideas on where to go from here. Well technically the LM339's output signal is being read by the LS245 when it is enabled which is then "translated" for lack of a better term onto the data bus. If the output of the LM339 is not changing this is the reason the game never sees the switch close. If the output of the LM339 is not changing this is the reason the game never sees the switch close. Would you suggest the OP put a logic probe on pin 13 of U11 and see if there is any activity when J9 pins 9-10 are jumpered? Is this normal behavior? If not, any idea what to test to track down the source of that issue? Logic probe or even a DMM will work since that comparator is not pulsed at all for these switches. Thank you everyone for the suggestions. I will do my best to follow up on them, however the issues that are being pointed at give me the impression that any failed part will involve some level of replacement of board parts. While I feel competent in soldering on early Bally SS boards (I have done more of that than I care to admit), this board has much more delicate traces and the consequences of me trashing it are far more severe compared to me trashing an early Bally board that I can by a spare of off ebay any day of the week. The sort version is I think this board is getting sent out to someone more competent. However I will do my best to update this thread on what they tell me the issue(s) is with the board. It's good to know your limitations but I would recommend some additional troubleshooting so when you send it out it's a fairly easy repair and not a full troubleshooting effort too. I don't know how many people have test setups for Capcom boards like they do for WMS / WPC games.